Long abandoned by the likes of MTV, the music video as an art form is at last undergoing a renaissance due largely to the internet and social media. To that end, Mike created and produced an experimental social music video for the indie rock band Jets Overhead. The project blurs the lines between video narrative and software generated storytelling. The band's song "What You Really Want" was tailor made for audience participation. The initial experience of the project allowed fans to upload photos of themselves holding hand-drawn signs of their most personal hopes and desires. Then the video's algorithm displayed a personalized set of user submitted photos during the song's chorus. The result was a new type of collaboration between band and fans. 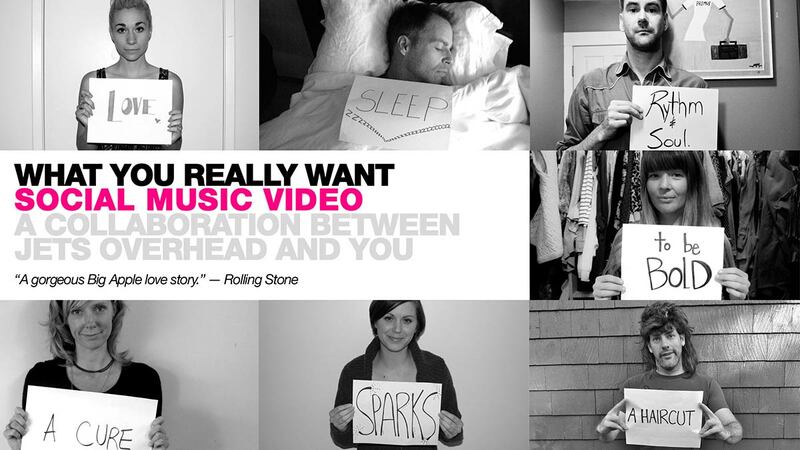 It incorporated original video footage, user-generated images submitted by fans, and curation by band members. The video content itself changed each time it is viewed. The video had its world premiere on RollingStone.com in December 2012.